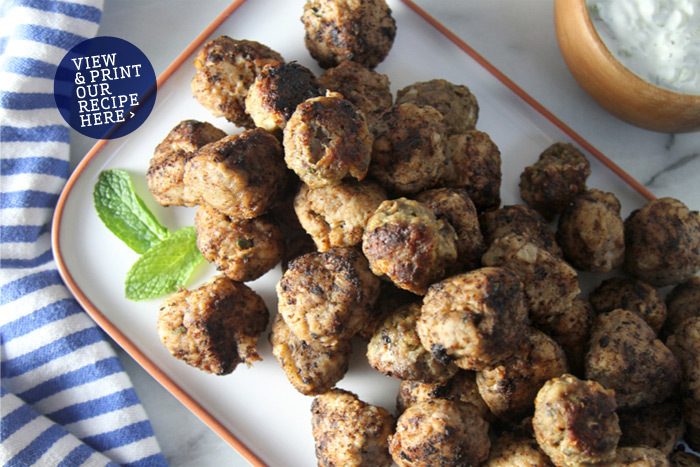 These Greek-style meatballs are tender, juicy, and full of fabulous flavors! Pair these meatballs with fresh, dilly Tzatziki sauce (recipe below). Serve the hot meatballs with a side dip of Tzatziki sauce and a side salad. Or, place a few meatballs in a pita pocket, add fresh greens, and generously drizzle with Tzatziki sauce. Alternatively, an orzo pilaf would also be a great complement to these meatballs with Tzatziki sauce. 1. Using a knife or small food processor, prep the onion, garlic, parsley and mint, set aside. Zest and juice the lemon, set aside. 2. Dip 2 slices of dry, white bread into the milk. Wring out any extra milk. Crumble the soaked bread into a large bowl. 3. Add the ground beef, ground lamb, minced herbs, oregano, salt, pepper, egg, lemon juice, and lemon zest. Mix the meatball mixture together with clean hands until evenly combined. 5. In a large skillet, add a thin layer of olive oil and heat. Once hot, and working in batches, add a few meatballs to the pan. Roll the meatballs around until nicely browned on all sides. Place the cooked meatballs in a covered dish while cooking the remaining meatballs. Serve hot. 1. Prepare the cucumber by peeling, removing the seeds, and grating with a coarse grater. Place the grated cucumber in cheese cloth, and squeeze out any extra water. Lightly salt the cucumber and let drain for at least 2 hours, or overnight in the refrigerator. 2. Mince the dill, grate or crush the garlic, and juice the lemon. 3. Mix all the ingredients together. Salt and pepper, to taste.